« TOMS: Shoes for Tommorrow! A bunch of ya’ll that have met me have asked me about my card-holder. Well, here it is. I grabbed a few of those free paint chips ya find at paint stores (home depot), made a few bends here and there, and bahm, you have your very own colorful hand-made paint chip card holder. I made a DIY guide after the jump, though the template’s custom to my cards size (3.5″x1.9/16″). The the home depot chips I used can just barely fit a basic 3.5″x2.5″ card with some changes in the template. Lots of pics after the jump along with the DIY instructions. To start off, go grab some paint chips(home depot, or any hardware paint store). Pick your favorite color or name. I went by the name, and went with the chip “Green Shimmer”, “Spirit Whisper”, and “Key Lime”! Here’s a template I made. I changed it up a bit, but you can download the updated version below. The Grey section is what you cut off. The white you keep, and the red lines are where you scribe and bend the card. Note: Put clear packaging tape over the printed template to avoid ink transfer to your paint chips face. This is the updated template for my custom card size. (click it and download it) To change the size of the template, make “A” the height of your card, and “B” the thickness that you want the card holder to be. The current design allows about 16-25 cards. You can shift the outlines around based on how you want to graphics from the chips to show up. Update: Here’s an updated template for a regular 3.5″ x 2″ biz card. 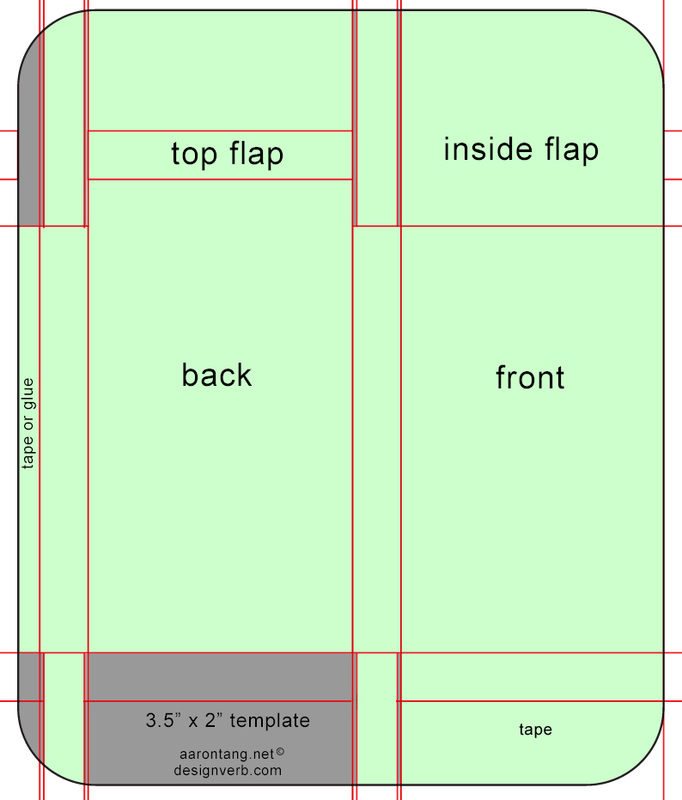 In this template, you will have to glue or double tape the final side internal flap noted as “tape or glue”. Enjoy! Take the template, and flip your paint chip upside down onto it. This allows you to make the scribe marks on the backside of the paint chip. Once ya got it down, tape down 3-4 sides. The tools you’ll need are simple: A ruler(straight edge), exacto knife, and scribe, or a rounded point(something that will crease the paper, but not cut). Scribe all the red lines. Be sure to avoid scribing over the entire back. It’s not bad if you do, but it just makes a much cleaner back surface. Cut away the Grey areas. The really small offsets are to give room for the paper to fold into each other, and also for a nice slot for the flap. Bahm! Everything is cut out, bent, and ready for some folding. Fold everything inwards, 90 degrees. Do not bend tooooo much in case some paint wants to flake off. Put a long piece of tape on the bottom part where I labled it “tape”. This is placed to give your cards a nice slide into your holder. Take that long piece of tape, and lay it down all the way through the top flap. If you can cover a majority of the length, it’s good, as long as it makes it up to the “top flap”. Otherwise, use extra tape, and cut off the excess afterwards. After you get the tape down, the rest of the folding should be pretty easy to figure out. The side flap is the 2nd to last step. 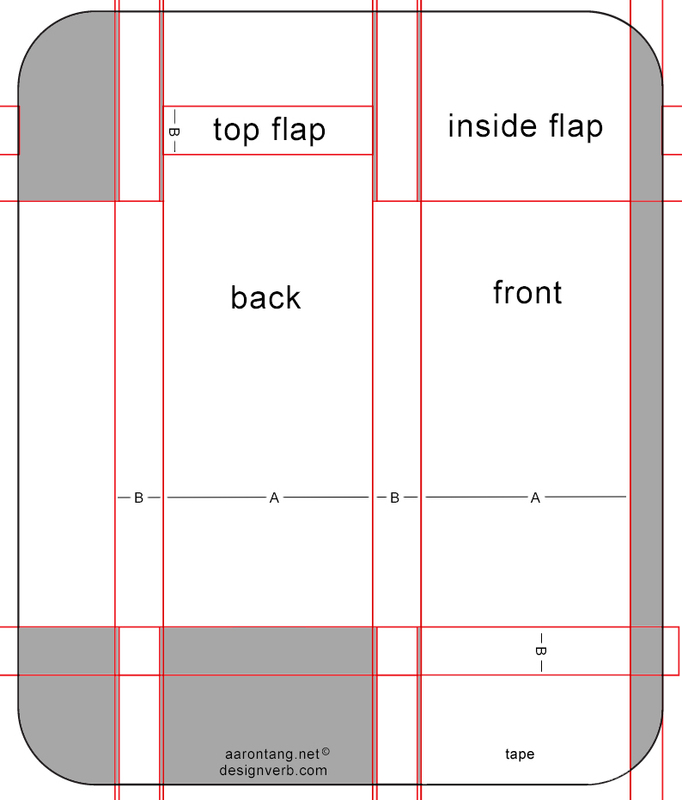 The last step should be folding in the “Inside Flap”. Once this piece is folded in, the whole thing should be locked all together without any tape. Pop your cards in, and make sure it fits! The inside flap acts as a spring in a way, to keep your cards snug even when theres only a few cards left inside. Now you might notice this buldge on the side. If you want, stick a piece of double sided tape inside before you fold everything together. Otherwise, it holds together nicely without any tape. You can also use glue or something. 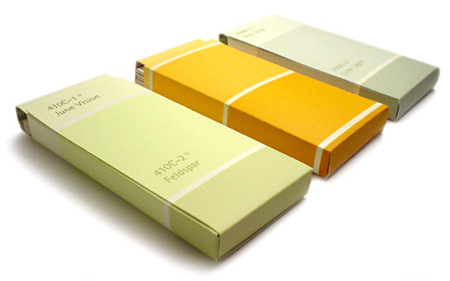 If you are using the same paint chips I used(5″x6″) and plan to make a card holder for a 3.5″x2.5″, then you will need to use tape since there is very little extra once you expand the template to fit the larger version. Bahm! Here is what you get as a final product after sticking in some tape! I made a bunch of them. On the right side is an example of the 3.5″ x 2.5″ card holder. A different color for every occasion. These might also work great for the wonderful Flickr Moo MiniCards I posted about before! This entry was posted on Sunday, November 12th, 2006 at 3:27 am	and is filed under art, design, experience, fun, green, ideas, information, inspiration, materials, me, style. You can follow any responses to this entry through the RSS 2.0 feed. You can leave a response, or trackback from your own site. thanx to others like you, many stopped stocking them. They cost the stores individually alot of money. Next time you buy paibt, those costs are calculated, per store, into the price. As an interior designer you piss me off as my clients take a specified number to hay or nay a color and there are no palette cards available! thanx to others like you, many stopped stocking them. They cost the stores individually alot of money. Next time you buy paint, those costs are calculated, per store, into the price. 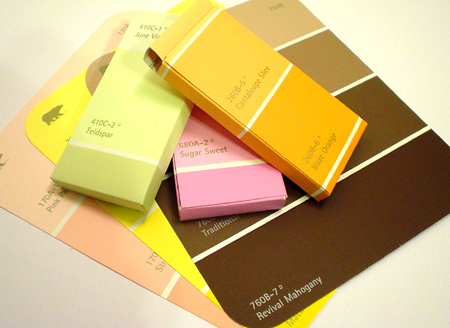 As an interior designer you piss me off as my clients take a specified number to hay or nay a color, there are no palette cards available! Paint Chip Card Holders! | DesignVerb!